Most people consider their pet to be part of the family, so it is understandable that when a pet goes missing this can be extremely distressing. UK statistics show that in the region of 200,000 pets are reported lost or missing every year. If your pet is microchipped, contact the database they’re registered with and report them as missing. Figures show that you are much more likely to be reunited with a lost pet if they are microchipped. For more information about microchipping, contact your local surgery. Check your property thoroughly. Look in hiding places, garages, sheds, etc. Kindly ask your neighbours to check their properties. Even the most unlikely places should be checked – pets can sneak into the most unsuspecting areas. Search your local area and leave details of your missing pet with as many people as possible. If you are searching for a dog, walk around the area where the dog went missing. Try and be prepared with a lead and some treats as your dog may be unsettled or scared. Contact your local vet, rehoming centres and animal charities. 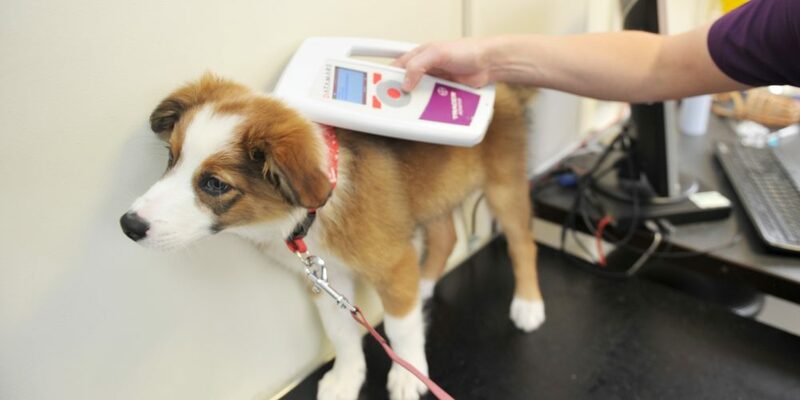 If your pet is microchipped inform them of the details, including microchip number. You can find the contact details of our surgeries here. Spread the word! Register your pet on lost and found websites, Facebook pages, Twitter pages etc. The more people you can reach the more chance you have of being reunited with them. You can register your pet as lost on our website here. Alternatively, if you leave a message on our Facebook page we will post your lost pet on our page and any other appropriate pages within our group. REMEMBER: be available to take calls or receive messages on any numbers you give out to the public and/or check your emails regularly. Finding a lost pet often brings out the good Samaritan in us. Knowing the right thing to do if you have found a lost pet can be difficult. Report any stray pets to your local council. Contact your local vet, rehoming centres and animal charities. If the lost pet is roaming about and not secure, provide as much detail as possible to their last known whereabouts. You can find the contact details of our surgeries here. If it’s safe, check to see if the pet is wearing an identity tag. Contact the number on the tag as soon as possible. Spread the word! Register the found pet on websites, Facebook pages, Twitter pages etc. The more people you can reach the more chance you have of reuniting the pet with their owners. You can register a pet as found on our website here. Alternatively, if you leave a message on our Facebook page we will post found pets on our page and any other appropriate pages within our group. Be wary of lost pets, they may be scared and distressed and act aggressively to strangers.